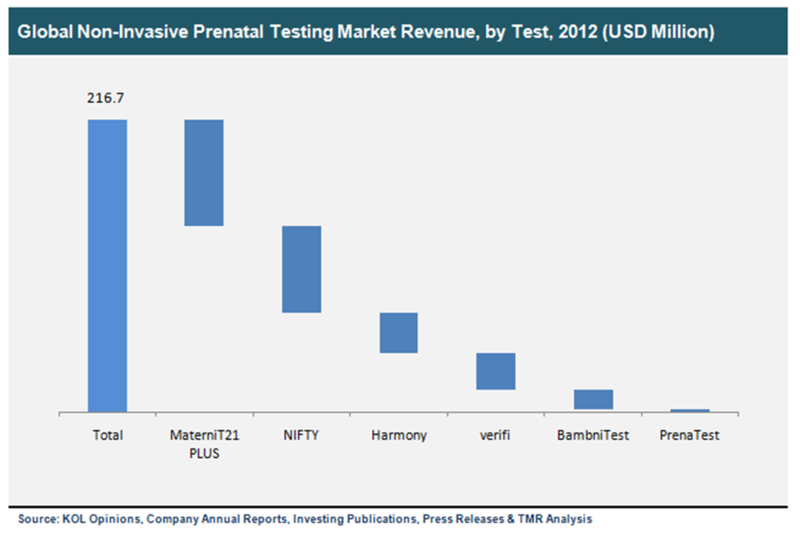 According to a new market report published by Transparency Market Research, "Non-Invasive Prenatal Testing (NIPT) Market (MaterniT21 PLUS, verifi, Harmony, Panorama, NIFTY, PrenaTest and BambniTest) - Global Industry Analysis, Size, Share, Growth, Trends and Forecast, 2013 - 2019," the global NIPT market was valued at USD 0.22 billion in 2012 and is expected to grow at a CAGR of 37.6% from 2013 to 2019, to reach an estimated value of USD 3.62 billion in 2019. The market for non-invasive prenatal testing is evolving rapidly due the advantages it offers over the conventional prenatal screening and diagnostic methods such as maternal serum screening, nuchal translucency (NT) scan, amniocentesis and chorionic villus sampling (CVS). These advantages include safety, accuracy, and no risk of miscarriage. An NIPT is a non-invasive genetic screening test for the common chromosomal abnormalities (trisomy 21, trisomy 18, trisomy 13, monosomy X, etc.) observed in the fetuses of high risk pregnant women (above the age of 35 years). Owing to its ability to detect the presence of chromosomal abnormalities in fetuses of pregnant women as early as 9 to 10 weeks of gestation, the market for non-invasive prenatal testing is witnessing a rapid increase in demand from all parts of the world. MaterniT21 PLUS, verifi, Harmony, Panorama, NIFTY, PrenaTest and BambniTest are the commercially available NIPTs in the market which are based on the direct analysis of cell-free fetal DNA in the maternal blood. In 2012, MaterniT21 (a proprietary product of Sequenom, Inc.) accounted for the largest share (36.6%) of the global NIPT market in terms of revenue, owing to the fact that it was the first mover in the market place. During the forecast period 2013 to 2019, it is likely to lose some of its share due to increasing market penetration by other aforementioned NIPTs such as Panorama and verifi.